Healthcare organizations spend hundreds of millions of dollars every year struggling to secure and protect patient records. Patients have traditionally demanded that their information be secured and inaccessible by the public. Regulations require due diligence to ensure that patient records are protected. In addition to this, healthcare organizations may also consider medical data as their intellectual property that can lead to further business intelligence. But what happens when patients volunteer their private medical records into the public domain? In this article, I’d like to present my thoughts on this topic. Consider the PatientsLikeMe website, which is a social networking platform for individuals to publicly share their medical data, including fine details of their diagnosis, physical conditions, locations, medications, mood, and other information. The benefits of PatientsLikeMe is clear: it is a wonderful platform for individuals and medical researchers to find useful statistical information about diseases, and for patients to connect with and share experiences with others who may be suffering similar conditions. False sense of anonymity. The PatientsLikeMe website does a fantastic job of declaring its openness policy by warning users that information shared on the platform can be collected and cached by search engines. I spent some time studying profiles of individuals affected with conditions that, unfortunately, have a social stigma attached to them. A lot of these individuals chose to use a nick-name, or handle, instead of their real name in their profile. However, by using mere link and network analysis techniques (as presented in my Psychotronica series of talks), I was quickly able to uncloak the real identities of many of these individuals. The issue here is that, despite the awareness efforts of PatientsLikeMe, many individuals using the service have a false sense of privacy: they may feel they are truly anonymous, yet their identities can be easily uncloaked. Stunning intelligence potential for the adversary. It is clear that information collected from patient records can be useful to an adversary. However, a sophisticated adversary is likely to correlate the information found in the patent record online with additional sources of social data (Facebook profiles, Twitter messages, blogs, etc). This combined dashboard of intelligence, collected from piecing together additional sources of publicly available information, puts the adversary at a significant advantage. Not only can an external entity ascertain pure medical data, but also make judgment-calls on the lifestyle of the particular individual that may have led to his or her condition. In addition, the potential abuse for social engineering and manipulation tactics is also clear. Business conflict. Many healthcare organizations are struggling to enforce security controls on traditional issues such as internal access management of medical data. Hundreds of millions of dollars are being spent by private healthcare organizations to promote internal security efforts. In the near future, as additional individuals share their medical information on social media platforms, the value of return from access controls to secure patient data will reduce. I realize the regulatory complications and influences here – it will be interesting to see how this plays out. In summary, the medical benefits of services like PatientsLikeMe is clear. However, I do wish that individuals who utilize these services are more cognizant of the privacy and security implications. I also wish that healthcare organizations quickly rethink their stance on the security and privacy implications of social media (which seems to be limited in scope to monitoring their own employees) to better align the reality of the upcoming social age with their business. It is my opinion that the popular expectation that Facebook will eventually take privacy seriously is unfounded. Facebook is a profitable entity and their business roadmap clearly illustrates that they feel they are at a stage where user privacy must be compromised for their business to grow. In other words, it is the users who must battle with the decision to either stop using Facebook, or to accept to collaborate and communicate using a platform that mines their private information to compute business intelligence for eventual profit. Perhaps this is a fair set of options, given that the concept of ‘social privacy’ is an oxymoron: if we want to be social and benefit from it, we must share information about ourselves. However, this sort of reasoning is not grounded in reality, for the same reason that disconnecting your computer from the Internet to gain the utmost level of security isn’t a reasonable option (for most people). It is also my opinion, that the online social space has created a condition where the end users must ultimately collaborate to initiate an ongoing privacy arms race. To promote this sentiment, and to further the cause of research in this field, I’d like to announce the AntiSocial project. The AntiSocial project is a subset of my research under the NeuroSploits umbrella (more on NeuroSploits later). I have developed a Firefox extension to promote this effort. If you are in a hurry, you can download it from https://addons.mozilla.org/en-US/firefox/addon/162098/ (beware that is is an initial release, but you are most welcome to try it out and provide feedback). At the moment, the following is what AntiSocial aims to do and how it works. - Preventing external sites from including Facebook content. This prevents Facebook from being able to track the user’s browsing habits external to Facebook (via the Referrer header). - Preventing users from landing upon Facebook from external resources. This also prevents Facebook from being able to track the user’s browsing habits external to Facebook (via the Referrer header). - Banning all access to 3rd party Facebook applications, including applications that choose to use Facebook’s Automatic Authentication in which users are not given the opportunity to authorize the execution of the 3rd party application. This will prevent arbitrary 3rd parties from being able to capture user data. - Preventing external sites that are landed on from Facebook from capturing this fact (by modifying the Referrer header). - Changing the Referrer header while the user browses the Facebook platform (this will not stop Facebook from collecting intelligence about the user's browsing habits within the platform, but it may make their data mining slightly more expensive). - Changing the referrer information tracked within the Facebook cookie (this will not stop Facebook from collecting intelligence about the user's browsing habits within the platform, but it may make their data mining slightly more expensive). - Initiating arbitrary requests to the Facebook platform to make it harder for Facebook and 3rd parties from computing business intelligence (work in progress) for given sets of computations that the user may not agree to. Please feel free to contact me with any bug reports, questions, or ideas. [As a caveat, I’m a fan of the NoScript Firefox plugin and I do realize that some (if not all) of these feature sets can and may be incorporated by NoScript - however, the AntiSocial Firefox extension aims to target users that may not be technically savy enough to maneuver a tool such as NoScript, and also to further my own understanding and research of privacy issues in social platforms]. + Hacking the Psyche: Remote behavior analysis that can be used to construct personality profiles to predict current and future psychological states of targeted individuals, including discussions on how emotional and subconscious states can be discovered even before the target is consciously aware. + Reconnaissance and pillage of private information, including critical data that the victim may not be aware of revealing, and that which may be impossible to protect by definition. + Techniques on how individuals may be remotely influenced by messaging tactics, and how criminal groups and governments may use this capability, including a case study of Twitter and the recent terror attacks in Bombay. The goal of this presentation is to raise consciousness on how the new paradigms of social communication bring with it real risks as well as marketing and economic advantages. The conference agenda is available. I also look forward to to hearing Billy Rios’ Biting the Hand that Feeds You (Reloaded). It will be my pleasure to meet Dhillon and team once again - they always put on a conference that is so wonderfully hospitable to the speakers and attendees. I'll be speaking at the International Conference on Cyber Security 2009 in New York (Jan 5 - 9). My talk is titled Suddenly Psychic (content modified from the talk of the same name I discussed before). The agenda is below. A recent US Army intelligence report identifies Twitter as a potential communication channel for terrorist activities. I think it is fantastic that intelligence efforts like this have the foresight to recognize emerging channels of communication and that there is effort being put into proactively enumerating the potential use cases. Yet, I am not impressed with the limited case studies presented in the report (the obvious case of Twitter being used for communication in addition to extremely specific situations of Twitter being utilized to trigger explosive devices). I feel that the use cases presented in this report are a good start, but they do not go beyond the obvious scenarios. Therefore, in this article, I want to further the discussion on how micro-blogging channels may be leveraged by terrorist organizations to obtain real time surveillance and intelligence of their efforts. I feel this sort of a conversation will be beneficial to counter-intelligence efforts (I will write a separate article on how Twitter may be actively leveraged by counter-intelligence). Before I go any further, I want to get out of the way a probable knee-jerk reaction that I suspect some readers may have at this point. I am in no way proposing Twitter or social media as an evil (in fact I'm a huge fan of Twitter and I use it on a daily basis). That would be as absurd as saying that the Internet is evil because criminals can use it to communicate. Twitter is a channel of communication - my goal is to point out increased capabilities this channel may provide for criminal use. I also want to point out that discussions like these are often brushed off as fantastical. Perhaps this response comes from the tendency to place too much weight on the (flawed) hypothesis that only past and known mechanisms are going to (re)occur in the near future. Consider 9/11: the incident would have been brushed off as fantastical had someone had the foresight to predict the scenario prior. Often, potential scenarios appear to be less probable not by rational conclusions, but because to the human tendency to believe that only past scenarios have the highest probability of occurrence. Nasim Nicholas Taleb makes this point, in addition to stating that impactful events are less predictable, in his his book The Black Swan: The Impact of the Highly Improbable - a must read for any security professional. The heavily armed attackers who set out for Mumbai by sea last week navigated with Global Positioning System equipment, according to Indian investigators and police. They carried BlackBerrys, CDs holding high-resolution satellite images like those used for Google Earth maps, and multiple cellphones with switchable SIM cards that would be hard to track. They spoke by satellite telephone. And as television channels broadcast live coverage of the young men carrying out the terrorist attack, TV sets were turned on in the hotel rooms occupied by the gunmen, eyewitnesses recalled. The authorities in India that responded to the attacks did not know about the Blackberries until after the fact. However, had the authorities known that the criminals possess Blackberries while the attacks were ongoing, they wouldn't have known how to leverage that knowledge. The point I'm trying to make here is that, in general, organizations that are responsible for researching and responding to incidents like these seem ill equipped because they do not know how to assess and leverage the increased utilization of information technology by criminals. While the attacks in Bombay were ongoing, Twitter seemed to light up with conversations. From citizen journalists, to concerned individuals looking for relatives, to volunteers who attempted to orchestrate blood donations, there were approximately 80 new 'tweets' on the #Mumbai channel every five seconds! It is clear how useful a micro-blogging channel like Twitter can be to the public during situations such as in the Bombay attacks. However, in the following list, I want to enumerate how potential terrorists may leverage a channel like Twitter to perform surveillance and mass manipulation, the sort of which were not possible prior to the micro-blogging medium. The list below is presented in the context of the recent attacks in Bombay but they can be applied for other situations as well. This is by no means an exhaustive list, but I think it is enough to get the conversation going. It is clear that Twitter messages can assist in rescue efforts, and in this case, they played a positive role in broadcasting details on where volunteers may help out by donating blood. The potential for abuse in this case relies upon the fact that, during emergency situations, people are likely to accept and re-broadcast messages without verification. The malicious Twitter messages above, with incorrect phone numbers, are just as likely to be re-tweeted. People who are able and want to donate blood will now no longer be able to effectively utilize the micro-blogging channel to contact the proper resources. Group sentiment analysis. The genuine nature of micro-blogging channels makes them a powerful channel to capture genuine human feelings. In my previous article, Hacking the Psyche, I presented how individual feelings from the social web, including Twitter, can be captured to create an emotion dashboard depicting the past and current states of feelings. Since the goal of terror attacks is to cause terror - sentiment analysis can be a powerful tool for the terror agents to measure the impact of their attacks. A mashup of an automated sentiment analysis engine using the Twitter API coupled with the Google Maps API can easily give the agents a clear visual of how their terror attacks are impacting the emotional states of individuals in particular locations, for example, are people in target location location x upset / scared / worried / angry / happy in response to the ongoing or recently committed attack? What locations around the world have reacted negatively or positively to the attacks? Leveraging and manipulating citizen journalists. Individuals in the vicinity of the ongoing attacks in Bombay were providing first hand reporting of police efforts. This information is likely to be extremely useful to the criminals. Furthermore, individuals on the scene may be remotely manipulated to provide specific information that a criminal may be seeking, for example, the following message could be posed to the #Mumbai channel by a malicious entity seeking further details: "Can anyone on-site please confirm the number of choppers above Nariman house asap?" Data poisoning police efforts. In a future article, I will attempt to enumerate ideas on how police may be able to utilize social media, one of the uses cases being the ability to leverage information from citizen journalists to strategize counter-efforts. A malicious response to this is likely to take the form of data poisoning, where the malicious party may post false information onto the micro-blogging channels while posing as citizen journalists. Geo-locating and instigating further panic. One of the goals of terrorism is to instigate panic. Many Twitter clients, specially those that run on mobile platforms, allow users to tag their specific geo-location. These information can be queried and coupled with sentiment analysis discussed above to measure the level of panic based on geographical locations. Further panic and unrest may be instigated by spreading false rumors. From the malicious party's perspective, it is a lot cheaper to create panic from spreading rumors than having to carry out physical activities. To illustrate, here is an example of messages that overwhelmed the #Mumbai channel by a single Twitter message from someone suggesting that the terrorists may be reading the information being posted. It was unlikely that the terrorists in the Mumbai incidents were reading Twitter, but the point I'm trying to make here is how fast such a rumor can snowball. So what does all of this mean? The goal of this article is to spread awareness and raise consciousness. The ideas presented in this article may appear far fetched at the moment, but with the explosive growth and integration of social applications into the lives of the Generation Y culture, it is increasingly probable that malicious parties are likely to leverage social media channels as time progresses. I feel it is important that we have a good grasp of how criminals may utilize these channels so we better understand the tactics of enemies we are likely to deal with in the future. Perhaps it may also be useful to extend this thought process to criminal use of social media in terms of cyber-warfare. Many people expect cyber-warfare tactics to be limited to defects in the network and application layers, yet it is increasingly plausible that government sponsored crime may take upon use cases that leverage social applications. 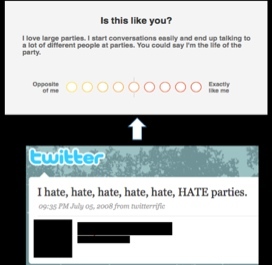 I have discussed the abuse of sentiment analysis in my Hacking the Psyche article that illustrates one such example. If you are interested in this topic and if you are in New York during January 6 - 8, I will be speaking at the 2009 International Conference on Cyber Security. In a previous article, Hacking the Psyche, I presented the security and privacy implications of capturing feelings of individuals using on-line mechanisms for good use as well as abuse and manipulation. Whenever controls around individual privacy are called into question, there is always, on the other side of the coin, a clear business opportunity. Corporations often use indirect data such as demographic information and sales statistics to measure the health of their brand because the direct data, i.e how the public and their customers actually feel about their brand, is not available for capture. In this article, I want put forth a case study to demonstrate how capturing feelings on the social web can allow companies to measure the reputation of their brand. In September 2008, Microsoft reportedly paid Jerry Seinfeld $10 Million dollars to star in it's recent TV commercial campaign. In this article I want to provide evidence to facilitate the hypothesis that Microsoft, in addition to paying Seinfeld, suffered the additional cost of damage to its brand from the commercials. On a positive note, the I'm a PC commercial that followed seems to have up for the damage. Most people disliked the first commercial (Red bar indicating overall negative feelings). The most common word used to express feelings towards the first commercial was "WTF" as indicated by the word cloud and the video demonstration. 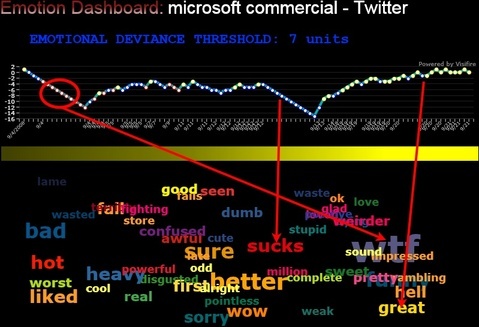 Feelings on the Microsoft brand started to pick up to a positive state only to be re-plummet downwards once the second commercial was aired (Red bar). The third commercial, I'm a PC, devoid of Seinfeld, was generally liked and appreciated, helping feelings towards the Microsoft brand return to a positive state (Yellow bar indicating 'happy' feelings). There you have it: a powerful method to use feelings expressed in social media to measure a corporation's brand and marketing efforts. Brand reconnaissance is not the only effort that can be leveraged from feelings on the social web. If you are interested in this topic, I invite you to consider my upcoming talk the O'Reilly Money Tech Conference titled Emotion Dashboard: Harvesting Feelings on the Social Web for Powerful Decisioning. In this article, I want to persuade you of the real possibility and high probability that, in the very near future, remote entities will be able target people’s on-line presence to capture and leverage their emotional states and feelings. There are some very extreme implications of this from a security and privacy perspective, and this is the scope I will adhere to in this article. On the flip side, the ideas presented in this article can be leveraged to construct powerful business decisioning and measurement capabilities, a topic that deserves it’s own space - I will cover this subject in a separate article in the next few days. Before I go any further, I want to stress that the purpose of this article is not to spread undue alarm, nor is the purpose to portray social online media as an evil. I personally utilize the many avenues of online communication and collaboration facilitated by the Generation Y culture. The purpose of this article, instead, is to share some of my initial thoughts on the possibilities of abuse, specific to the mapping of individual feelings online and possible implications. In this talk, Jonathan describes his passion for making sense of the emotional world and his deep compassion for the human condition. Regardless of this particular article, Jonathan’s talk stands on it’s own. I think Jonathan’s ideas, projects, and aspirations are true works of art. His ideas are powerful enough to inspire a security professional such as me to look outside the oft-incestual world of information security, and to reach out and connect with other venues of Science and understanding. In a small way, the material presented in this article are my attempts to try and do just that. The result is a database of several million human feelings, increasing by 15,000 - 20,000 new feelings per day. Using a series of playful interfaces, the feelings can be searched and sorted across a number of demographic slices, offering responses to specific questions like: do Europeans feel sad more often than Americans? Do women feel fat more often than men? Does rainy weather affect how we feel? What are the most representative feelings of female New Yorkers in their 20s? What do people feel right now in Baghdad? What were people feeling on Valentine's Day? Which are the happiest cities in the world? The saddest? And so on. At its core, We Feel Fine is an artwork authored by everyone. It will grow and change as we grow and change, reflecting what's on our blogs, what's in our hearts, what's in our minds. We hope it makes the world seem a little smaller, and we hope it helps people see beauty in the everyday ups and downs of life. We Feel Fine is a work of art designed by well meaning intellectuals. It doesn’t have the capability nor the intention of intruding on any one particular person’s privacy, yet the project raised my personal consciousness towards the security and privacy implications of capturing the feelings (past and present) of individuals. In other words, the targeted individual’s online presence may include his or her Facebook profile updates, Blogs, and Twitter messages. In this way, updates on all of the sources of a particular individual’s online presence can be coupled together in one RSS feed and then supplied to Emotion Dashboard which will scan the feed from the past to the present (older entries first). Pulse. In order to visualize the emotional state of an individual from the past (older RSS entry) to the current, the tool includes a line graph at the top of the interface that tends upwards when a word that expresses a happy (positive) emotion is found, and downwards when a word that expresses a sad or angry (negative) emotion is located. To accomplish this feature, I was able to leverage the CSV file provided by the We Feel Fine project located here: http://www.wefeelfine.org/data/files/feelings.txt. This file includes a list of words that are commonly used to express feelings. I marked each word in this file against my judgment of it being a positive or negative sounding word. Occurrences of these words are plotted on the line graph, and can also be clicked on to spawn a new browser session targeting the relevant location of the word. Immediately below the line graph is a solid bar that expresses the culmination of the individual’s overall mood. The color of this bar is either Yellow (happy), Blue (sad), or Red (angry). The hex code for these colors are also derived from the We Feel Fine CSV file listed above. I concede that this technique of merely grepping for words lacks context and that is prone to an extremely high error rate. However, given the limited amount of resources I have at this point, my goal is not to provide something that readily usable for all cases, but to present a starting point of a possible approach and the probable implications should this be extended to apply intelligent grammar based contextual analysis. Do note that, even though I concede this is an approach vulnerable to a high error rate, the technique does, statistically speaking, get slightly more accurate the more words it consumes. Word Cloud. Below the line graph is a simple word cloud containing words from the CSV list discussed above. As the RSS feed is analyzed from past to present, words in the word cloud grow in size as they re-occur. 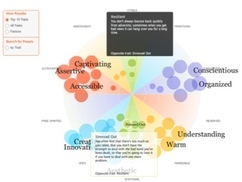 The word cloud allows the user to analyze the words being used to express feelings as the Emotion Dashboard reads the RSS feed from past to present. The words in the cloud are colored based on the associated hex color codes present in the CSV file. 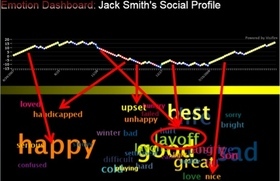 Jack’s initial online presence portrays his emotional state as positive (word-cloud: happy). Jack’s blogs about his friend being laid-off from his job (word-cloud: layoff). This is a negative event. Jack’s mood recovers to a positive state as time progresses, only to be briefly pulled down momentarily by his discussion of his friend’s layoff situation. This illustrates that the after-shocks of his friends situation are still negatively affecting him. Eventually, Jack recovers to his average positive state (word-cloud: nice). Case Study: Criminal Investigation and Analysis. There are numerous security and privacy implications of the discussion at hand. I am unlikely to succeed in attempting to iterate them all. Instead, I want to present one particular case study that can further illustrate the impact of this topic. Initially, Danlee’s Myspace profile frequents negative-feeling words (blue bar). His profile remains consistently negative over time (blue bar). The words used in his updated profile tip the mood bar to positive (yellow). This is when Danlee changed his profile right before committing the crime. Following from the above observations, it is clear to see how this type of analysis can be used by investigators, admittedly after-the-fact, to get a glimpse into a suspect's state of mind over time. It may not be possible to use data from online social media to proactively detect the future behavior of all individuals, yet in this situation, the criminal did indeed have prior history of crimes. Perhaps a proactive approach targeted towards known suspects’ online social presence can be used to detect certain deviance form tuned thresholds - possibly in an automatic fashion based on a set of defined triggers. Such an approach seems more tolerable for a set of individuals with known backgrounds because the elements in their history can aid in influencing the signal-to-noise ratio in favor of the signal. There are positive and negative implications of targeting individuals (or groups). In the first situation, it is easy to see how Jack’s online activity was used to get a better understanding of his psychological state, in addition to the hypothesis on how something like this can be further extended to aid in malicious manipulation and influence by a malicious entity. In the second situation, it is clear to see how the visualization of expressed feelings online may aid investigators into obtaining further insight into a given case. The victim is the volunteer. Individuals with social presence online willingly contribute and volunteer data that can facilitate the mapping of their psyche. This is in contrast to the Orwellian sense, where information is extracted from the victims in an intrusive way. The data set is genuine. Most people do not over-edit their blog entries or Twitter messages to conceal emotions. The study of an individual’s online presence and it’s correlation to emotion and personality analysis is most likely to remain probabilistic. This introduces the risk of unfair analysis. For example: What does it mean for an individual to be identified, and in turn judged, as someone with a 15% chance of being a psychopath? (online) Social privacy is an oxymoron. Social applications are, by definition, mutually beneficial to users within the system. If you sign up on a social networking application as Mickey Mouse to protect your identity, your friends will not be able to find you, thereby decreasing the value of the system to you. The popular social networking sites often promise privacy by implementing controls on certain tuples, yet as a user, it is important to understand that there is implied and indirect information within the system (such as connections between networks and the cases presented in this article) that cannot be concealed without destroying the core use-cases of the social application. To conclude, I sincerely hope this article facilitates further discussion around the topics presented. You may feel that the probability of fruition of some of my thoughts and ideas is low. Perhaps you may find them extremely fantastical, or perhaps you agree that the scenarios presented indeed have a high probability of being relevant in the near future. I am obviously intrigued by the topic and I’d be delighted to hear your thoughts. During the next few months, I will be presenting a brand-new talk titled "Suddenly Psychic: Knowing Everything About Everyone" at various conferences around the world. I will be presenting it with Akshay Aggarwal, a good friend of mine. Akshay and I have enjoyed researching the business, security, criminal, social, and psychological implications of this topic, and we look forward to sharing our research with you. Currently, this talk is scheduled debut at the Microsoft Blue Hat Conference [v8] in October, followed by Hack in the Box in Kuala Lumpur. Imagine a world where you can remotely influence other people's behavior. This talk will expose how information about people in the physical world, coupled with voluntary information from new communication paradigms such as social networking applications, can enable you to remotely read people's minds to influence their behavior. Techniques on how individuals may be remotely influenced by focused marketing and messaging tactics, and how criminal groups and governments may abuse this capability. Reconnaissance and pillage of confidential information, including intellectual properties owned by businesses. Falsified profiles used to construct undeserved reputation as well as the risk of reputation tarnish. Remote behavior analysis that can be used to construct personality profiles to predict current and future psychological states of targeted individuals, including discussions on how emotional and subconscious states can be discovered even before the target is consciously aware. This topic will be extended to demonstrate the possibility of criminal abuse and the enablement of economic drivers. Decreasing the value of social networks through data poisoning attacks. The goal of this presentation is to raise consciousness on how the new paradigms of social communication bring with it real risks as well as marketing and economic advantages. Perspectives on negative and positive uses will be presented in addition to academic discussions and thoughts on how to enable the upcoming online social age.